Ford India is on an aggressive streak since the last two quarter. The manufacturer has refreshed its entire portfolio with the Ecosport being first then the Aspire, Endeavour and now the Figo hatchback. The Freestyle was also introduced earlier last year and it was a runaway success for the manufacturer. 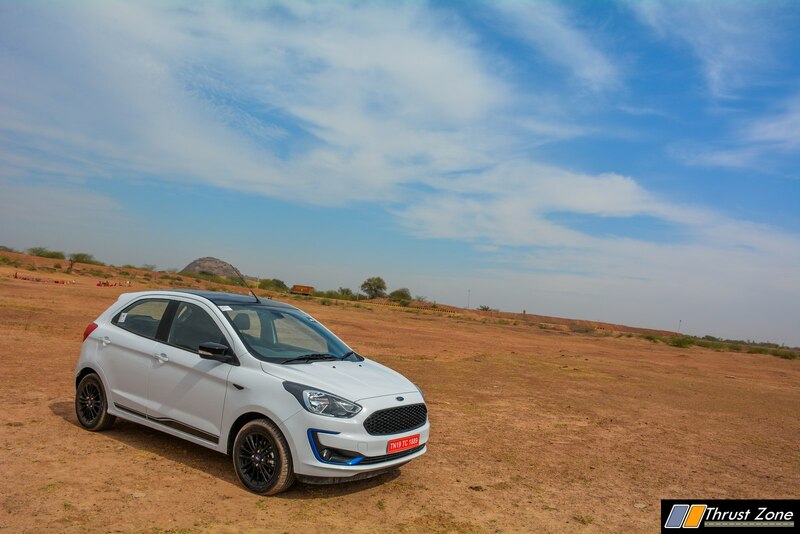 This time, we sampled the Figo hatchback in its facelift avatar and which also gets a new Blu variant which was based on the the Titanium variant. How are the new additions and have they made it better than the already previous car? We find out. The design is the same in terms of sheet metal and overall dimensions stay identical. However, the grille here is blackened out, there is a blackened out badge on the front fender, the the ORVM’s are black, so is the roof and the alloy wheels. The white color car with blue inserts in the front fog lamp area which now has a bumper overall and the boomerang effect is now more apparent. The rear bumper gets a minor faux air vent at both ends. Tail-lamps remain the same but the front headlamps are blackened out. The highlight is the new center console with the new class leading, well performing system with a 7-inch infotainment screen. The sound system is great as always. The lack of Android Auto and Apple Car Play is surprising. The manufacturer says they are is a possibility very soon in the future it can make it to the car. Plastic quality all around is average but fit-finish is good all around. What the top-end variant gets is auto IRVM on the inside, a start-stop button, remote key, the same instrument cluster, height adjustable seats, electric ORVM, USB, AUX, climate control, reverse parking sensors, reversing camera and charging ports all around the car. Automatic wipers and headlights are on offer but only on the Blu Titanium variant for now. Space in the back is good with enough knee and legroom but shoulder room and headroom are slightly tight for taller adults. Boot space is good at 257 litres and it deep so it is a bit tussle getting stuff in and out. The hatch still misses out on adjustable seat height belt. Safety is the biggest highlight as dual airbags along with ABS and EBD are standard. 6 airbags are offered on the top-end variant which is a great move by Ford. There are three engine options to choose from, which is already segment highest. 1.2 petrol making 96 PS of power. 1.5 diesel making 100 PS of power and 1.5 petrol with automatic making 123 PS of power. 1.2 petrol and 1.5 diesel are the ones we have sampled this time with a new 5-speed lighter and crisper gearbox that is on offer. This has made shifting not a problem on the new car by a good margin. Clutch is light but travel is long so it can be a bit snappy. NVH levels from both engines is very low for their respective fuels and aid in a relaxed driving for hours that you might want to do for a trip. Road and wind noises are well contained and never bothersome. Petrol lacks the immediate response by a fair bit over the diesel counterpart. However, the 1.2 petrol needs patience to get the best driveability out of it, be it while driven slowly or fast. Top-end torque concentration with taller gearing means driveability and performance are there, but need a bit of effort to be squeezed out. Diesel on the other hand, with a tiny bit of turbo lag just pushes you ahead in the horizon and is doing illegal speeds in no time. A car which cost this less shouldn’t be doing this, but Ford loves giving value and performance and we appreciate that move. Mid-range and top-end is class leading by miles when compared to competition which makes our pick of the lot. 1.5 petrol automatic is yet to be sampled so we reserve our thoughts on the same. The Blu variant we drove had 15-inch wheels with minor tweaks to the suspension, even lower then the S variant in terms of suspension change. However, it continues to be fun to ride as the S variant to a very large extent. The ride is stiff but compliant over pot holes and road imperfection. Be it low or high speed, the damping is spot on and it just glides over bumps with confidence and compliance like no other hatchback in this segment be it on the highway or the city. Tyres were good in terms of mechanical and literal grip. Brakes offered excellent stopping power and bite on the pedal. Steering can feel artificial at times, but the feedback is good most of the time and it is very precise to tell you what the front wheels are doing. Overall, with no body roll, great setup of the suspension and drive train, the Figo continues to be the benchmark overall driving pleasure as it is easy and engaging to drive. Ford has taken the segment to an whole new level with the promise, warranty and guarantees it is offering. 5 year warranty/1 lakh kms, cheapest spare parts and maintenance cost got even better with new improved localization of 1200 changes done to the car. The amount of passive and active value on offer cannot be matched even by the two biggest manufacturer in the market. Ford is truly offering peace of mind, fun to drive and safety in abundance with its new improved hatchback. Clearly, this time it is impossible to avoid the Figo if you are in the market for an hatch in this category.